Skylights Pros and Cons: Are They Worth the Money? Anyone who has had a skylight, or vacationed in a cabin with a skylight knows how much beauty they can add to a home. It is magical to watch the snow fall from above and to see the stars at night where there was less light pollution. That’s why so many people want them even though they are expensive and prone to potential problems. Let’s take a look at the pros and cons of skylights before you make the final decision to have one installed. If you are thinking about having a skylight installed, you need to make sure you are making an informed decision. That last thing you want is to be surprised by the ongoing costs involved. Skylights allow light into interior places that can’t otherwise get light. For example, the bathroom in the middle of your house that has no window. Aesthetically Pleasing A skylight provides a beautiful window to the sky and can change the entire atmosphere of your room. 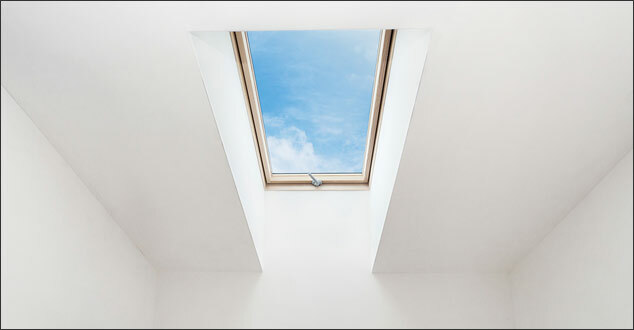 A venting skylight can provide fresh air to a room – again, like a bathroom – that doesn’t get much fresh air. They can help with natural cooling through venting in summer months or in places that stay warm all year round. It is important to make sure if you opt for a venting skylight that you can reach it easily. Otherwise, many people don’t bother and then the venting function goes to waste. Skylights installed in the proper place in your home can provide indirect solar energy. A skylight on the northern side of your house can provide cool, indirect sunlight. A skylight on the southern side can provide indirect solar heat in the winter. However, it must be shaded in summer to prevent overheating. East and west placed skylights provide either morning or afternoon heat. The cons of having a skylight installed are worth thinking about. Of course, if you are prepared for them and you know what to expect, it’s not a problem. Skylights are expensive – to install, to maintain, and they affect your energy bills. You can’t get around it. They will gradually create wear and tear on your roof because they are prone to leaking. Some insurance companies keep this in mind if you have a skylight, so your premiums may go up. Did I mention roof leaks? Of course, the problem can be improved by buying a high quality skylight. You will want to stay away from glazed with plastic skylights that wear out and discolor. They are cheaper at first, however, you will pay in the long run. Make sure the skylight will be mounted above the surface of the roof. In addition, make certain a curb is installed (a raised, watertight lip that deflects water away). There should also be proper flashing and that the joints are sealed. Waterproofing sheets should be installed over the flanges/flashing under the finish material. And extra water diversion pieces – roof crickets or diverter strips – usually cause more problems than they solve. Interior damage to your furniture or carpet is a concern. Skylights are definitely more sophisticated now than they used to be. Make sure you get one that is laminated and/or tempered glass with low-e or tinted coating to control the UV and heat. You can go to the National Fenestration Rating Council to check how they stack up with each other. If you find your furniture is suffering, you may have to install a shade or screen. A large skylight could potentially damage your roof structurally. You need to find out if you have a truss roof – it’s not a good idea to modify a truss roof in the field. However, a standard roof framing can handle most kinds of skylights without a problem. Above all, check with an experienced roofing contractor to find out what kinds of costs you are looking at when considering a skylight. Make sure they know what they are doing and that everything will be installed properly. If you are ready to have a skylight installed and live in Southwestern Michigan, please give us a call. My husband and I have been thinking about getting a skylight. We have never had a skylight before and we were wondering the pros and cons of having one. I’m glad you mentioned that they can help provide fresh air to a room if we are able to reach it. We will have to see what kind of options we could get. Thank you for the information!